Three songs on Shakespeare sonnets for soloists and chorus; premiered Sunday, January 24, 2016, 5:00 p.m. at King's Chapel, Boston under the direction of Heinrich Christensen as part of the "Shakespeare in Music" concert; program included works by Vaughan Williams, Mäntyjärvi, Richard J.S. Stevens, Morley, and Gabold; commissioned by King's Chapel. Composed for tonight’s King’s Chapel choral program, Gems and Tempests is a setting of Shakespeare’s sonnets numbers 8, 27, and 116. When Heinrich Christensen approached me about doing choral settings of these venerable works, my mind turned immediately to the challenges of such an undertaking. First, the sonnets are presented in the first person singular—arguably, Shakespeaere’s own voice—which poses obvious issues when preparing a musical setting for a chorus of twenty mixed voices. Second, the density, complexity, and archaic nature of Shakespeare’s poetic language poses major hurdles for many contemporary audiences. How then does one create a singable and comprehensible musical setting of a Shakespeare sonnet? My approach was to compose these pieces as solo songs and to use the chorus in a supporting role, accompanying at times, creating counterpoint and reflection at others. 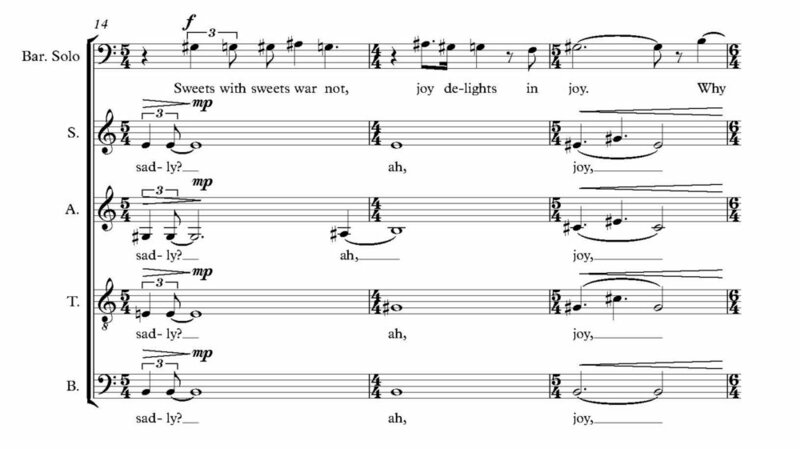 There are instances where the chorus employs effects that mimic instrumental sounds—the plucking of strings, for example—as a direct reference to elements from the sonnets (“Mark how one string, sweet husband to another, strikes each by each in mutual ordering…”). The last of the three songs, sonnet 116, is an adaptation of an earlier setting that was commissioned by soprano Mary Ann Lanier for voice and piano trio (Be My Love: Songs of Love, Lust, and Other Folly).